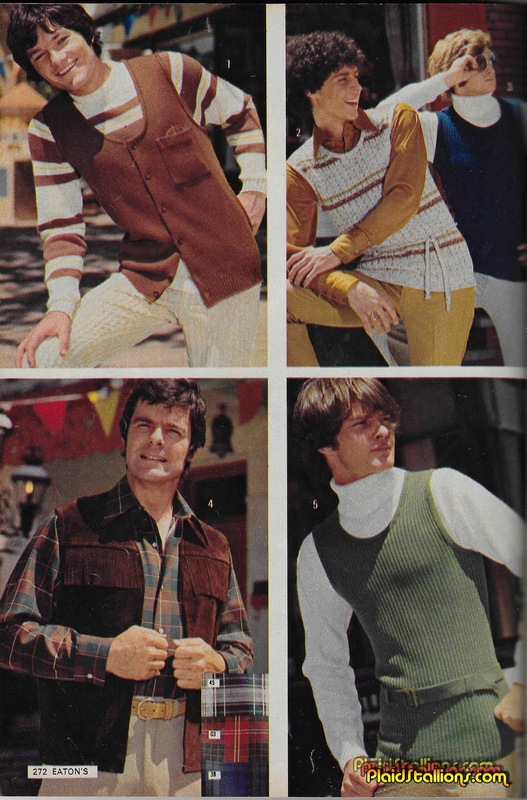 The Orlon infused style known as the "Over Look" peaked in 1971 and vanished from our landscape. Each year fans gather in Tallahassee Florida for an annual convention and dream of the days of its grand return. The sight of this is just a total happiness trigger to me. I especially want that Dinosaurs display box. 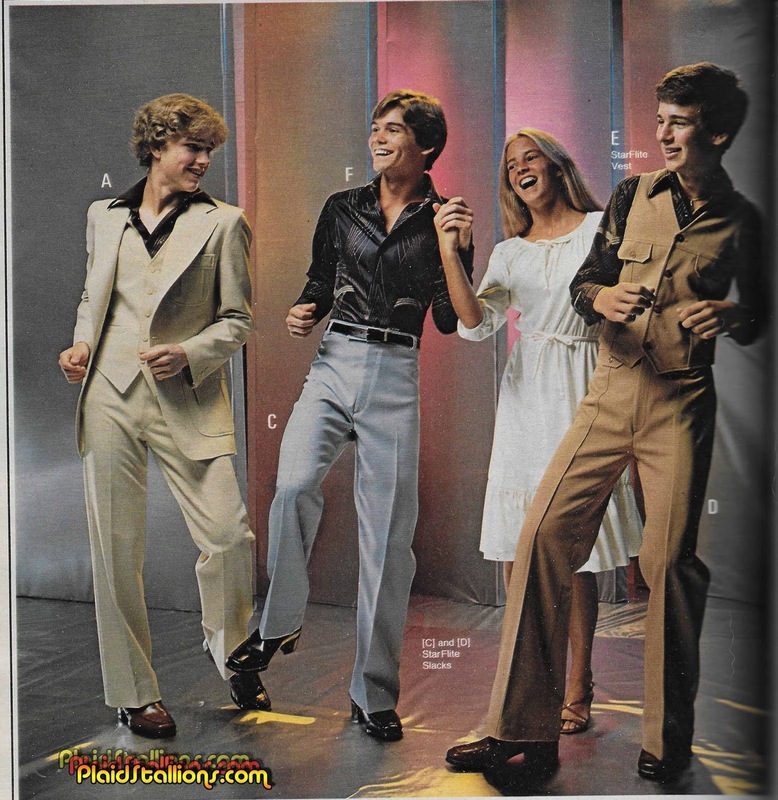 If anybody offers you coke at this disco, it's going to come in a bottle. This week's installment of Toy Ventures is all about one of the coolest action figures of the 1970s, Slade: Super Agent by Shindana. We talk about Slade but also a little bit about the company that was Shindana toys and how they changed the landscape for the better. Korean Greatest American Hero trading cards- The best part of this auction is you can get an uncut sheet of these for $11. I'm tempted to frame them. Spider-Man Bowling Set: I featured this in Rack Toys and it's just so wonderfully absurd although the fairly expected social activity of a middle-class kid from Queens in the 1970s. Black Hole record from France: Golly, I wonder what Le Trou Noir could mean? The cover art is pretty fantastic here. Green Lantern Halloween Costume- This has got to be one of the earliest bits of merch the character got, kind of funny that the box is surrounded by Marvel characters. AIP "I was a Teenage Werewolf" promotional glass- I guess AIP made this as a celebration of the film's success in 1960? I had no idea but it's real gold and this was only given to employees, nice. This wonderful package was likely handed to every attendee of the 1975 Marvel Comics Convention it includes a program which we'll get into but it also includes the Might Marvel Mail Order Catalog. 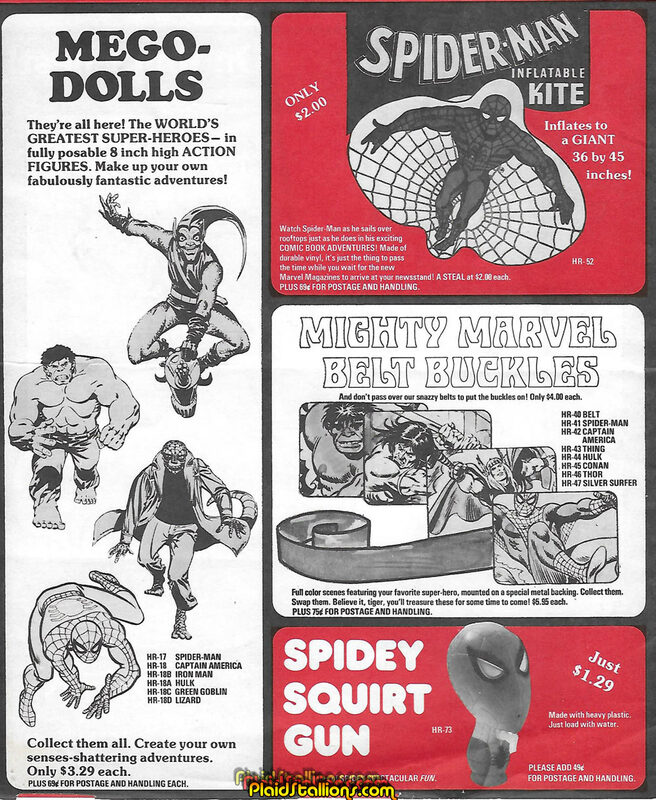 This wonderful catalog features Marvel merchandise from Fleetwood, Mego. Durham, Aurora and more. The historical significance is that Marvel would eventually abandon the mail order practice and selling it to the man who created it, Ivan Snyder. Ivan would then move the business to New Jersey and call it "Heroes World"
The 1975 Marvel Mail Order Catalog is more fun than a Giant Sized Man Thing! 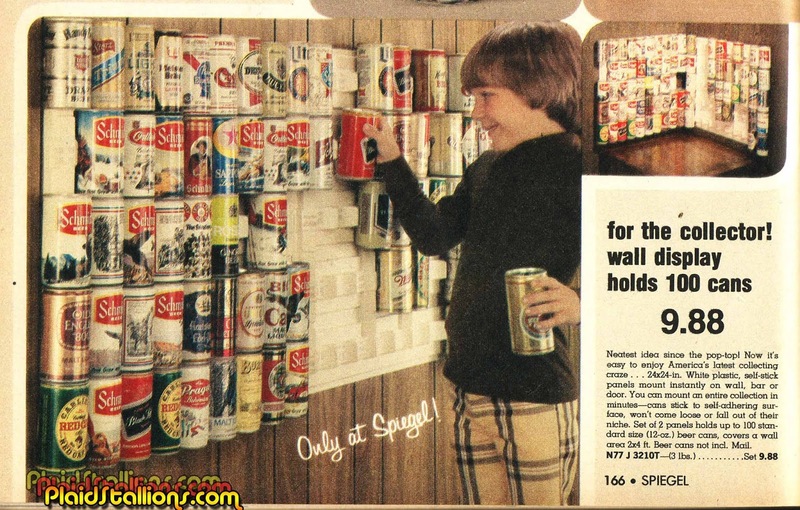 I had a display like this back in college but with 40oz malt liquor bottles, I called it the "Wall of Shame"
Scare Cycles FrankenCycle by Ideal- After Evel Knievel did his little trick with a baseball bat, Ideal toys was left with a very popular toy concept without a theme. Scare Cycles placed the classic monsters on choppers, it made no sense but who cared? 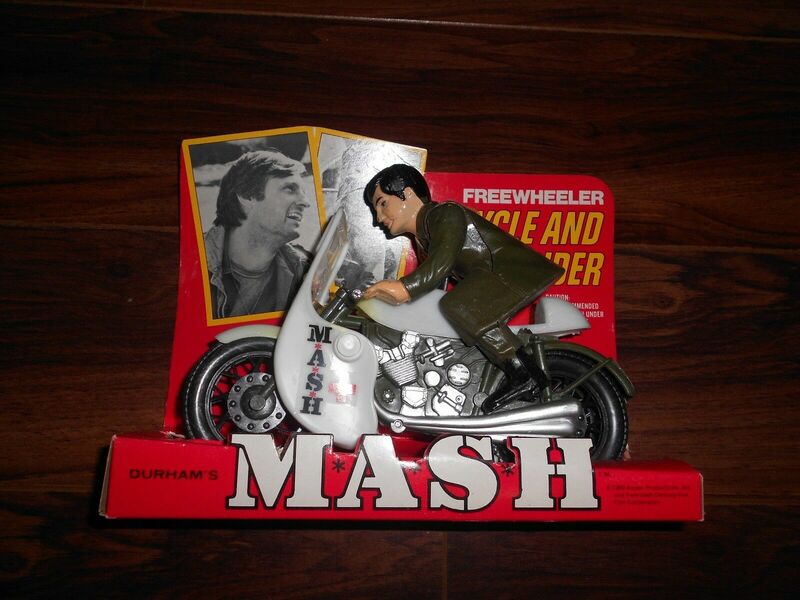 Speaking of weird nonsense on Bikes- Who didn't want a freewheeling Alan Alda on a motorcycle as a kid? I would have preferred Jack Klugman but this isn't terrible. Buck Rogers Playset by HG Toys- I don't know what I love more here, the toy or that gorgeous Earl Norem art on the box. FireBirds are Go! - One of the more blatant knock offs produced by Zee Toys, they weren't even trying to disguise that these were ripping off Gerry Anderson's Thunderbirds and I love them for that! Sealed Remco Mini Monster Play Case- I always liked the notion of the Monsters being room mates, even as a kid. 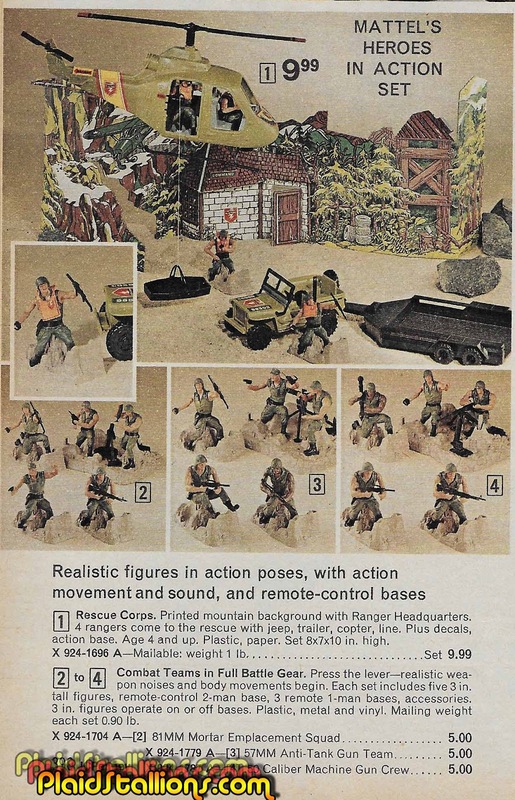 Mattel's Heroes in Action is easily in the top 3 PlaidStallions "Hey I had this toy as a kid" emails we get. The line's military flavour is unique during a time when war toys weren't quite in vogue. I remember them mainly from the gorgeous comic book ads but I never saw them as a kid, quite a beautifully designed series. 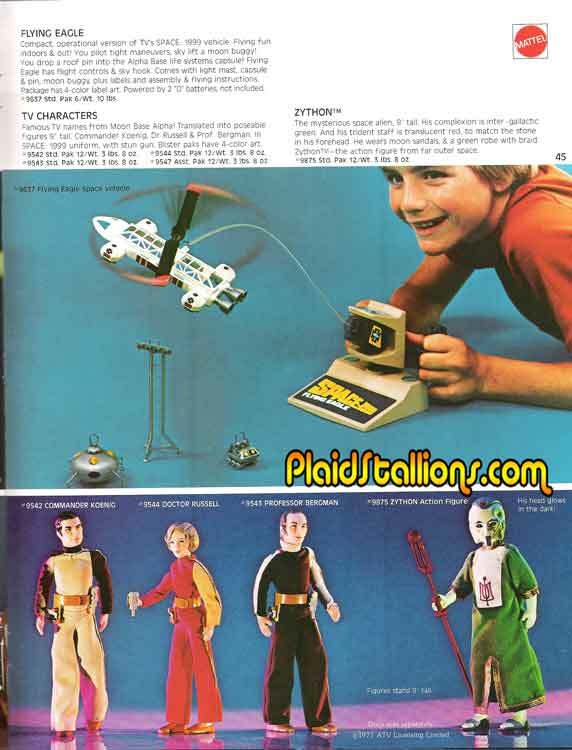 You can the 1975 Mattel Heroes in Action Catalog and the 1976 Mattel Heroes in Action Catalog here. A very happy Valentines Day from all of us at PlaidStallions, now if you'll excuse us, we have action figures to photograph. 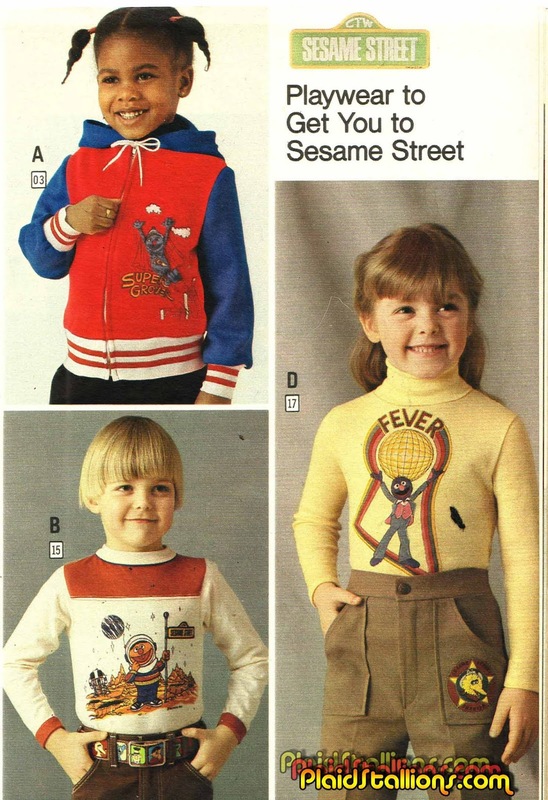 A leisure-suited Grover emblazoned on a yellow turtle neck, I now know what i wish to be buried in. 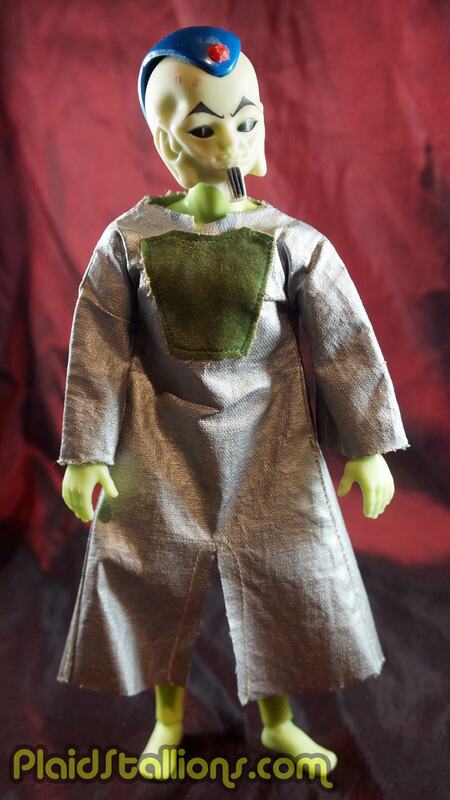 The Zython was offered in the 1977 Mattel Catalog as an alien character to go alongside with Mattel's Space:1999 action figure line. It never appeared in the series but was a rather welcome addition to the line which desperately needed more flair. 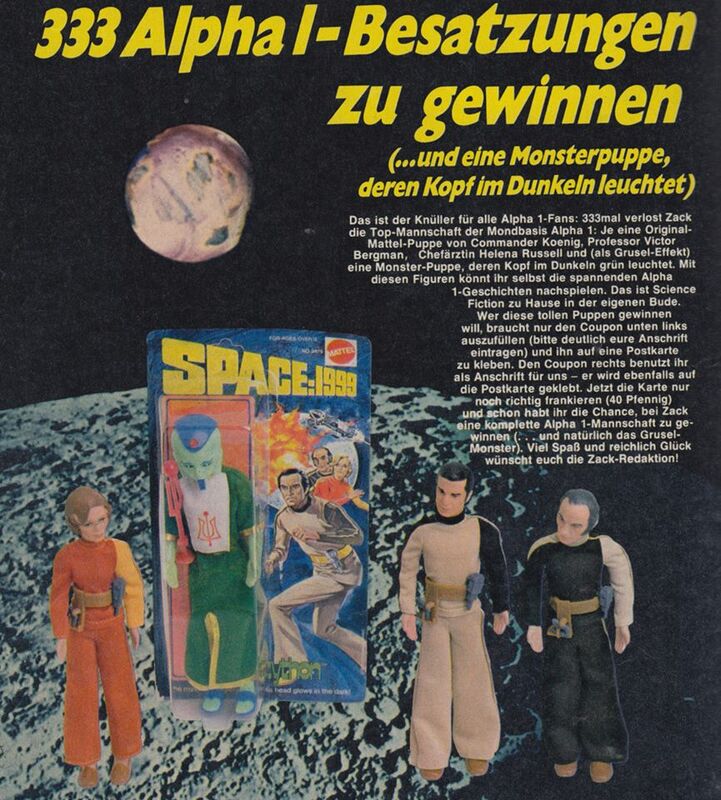 However, sales on Space:1999 merch weren't strong enough to warrant a wide release and the Zython seems to have only been offered via this contest for a German comic book above (Thanks Eddy for the scan). It's speculated that less than 300 of these were made, we'll probably never know for sure but a few have trickled out of Deutschland over the years. 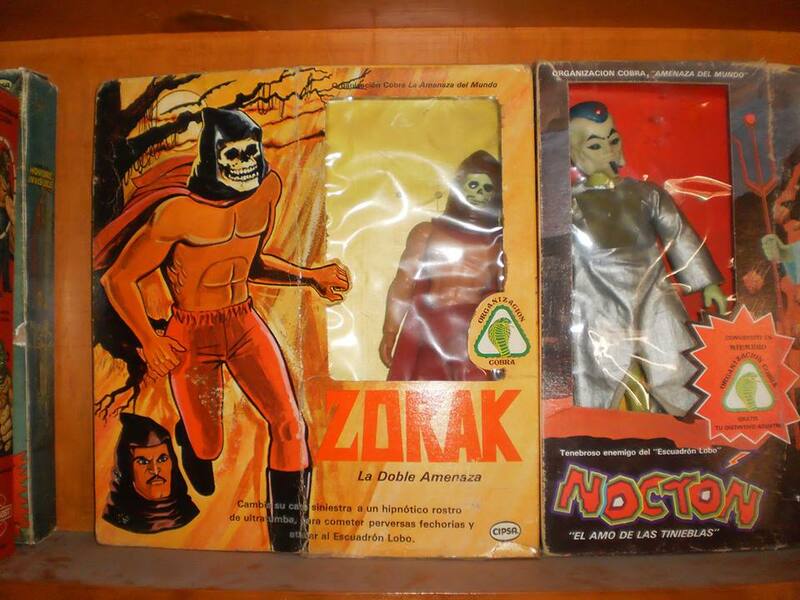 But of course, this is Mattel we're talking about here, they'd never let a good toy mold go unused, so Zython would later appear in the amazing Mexican version of Big Jim (known as Kid Acero), which was produced under license by a company called CIPSA, who would dub him Nocton an alien enemy of Kid Acero. So, while I'll probably never own a Zython (the last one went for just under a grand), I was able to buy a Nocton in the 1990s and still have him to this day. One day I hope to track down his scepter.